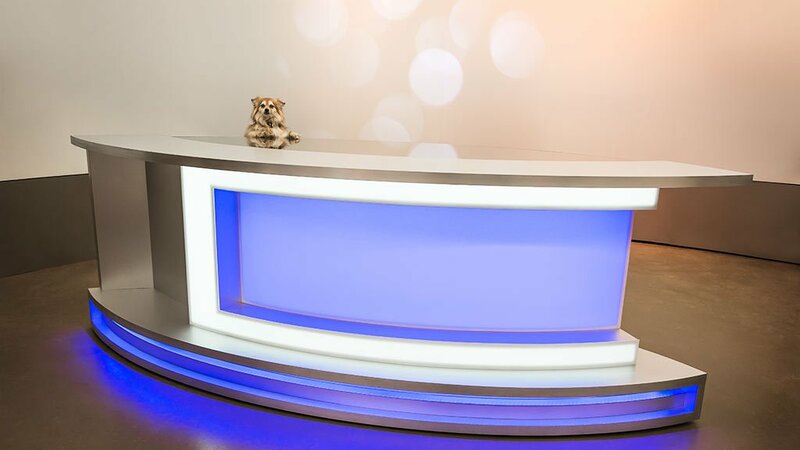 New broadcast news anchor desk for sale! One of the options for this particular desk is a special platform that divides away the desk. This is so you can use one platform for both your newscast, and an interview set. The section of platform with the desk on it just rolls away (a couple minutes at most), leaving the rest of the platform for comfortable interview chairs. Read more on the product page! This is an example of our Anchor News Desk. You can find it in our Products menu, under News Desks — Anchor News Desk. We can have it designed, built, and installed in your studio in just a few weeks time. In a rush? We can do it even faster.